What is the MAXIFS Function? The MAXIFS Function in Excel is a Statistical functionFunctionsList of the most important Excel functions for financial analysts. 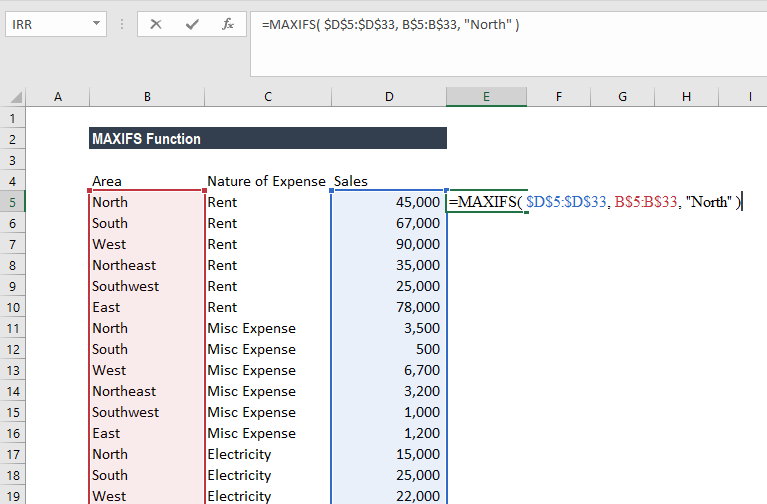 This cheat sheet covers 100s of functions that are critical to know as an Excel analyst that returns the maximum value based on one or more than one conditions from the specified cells. 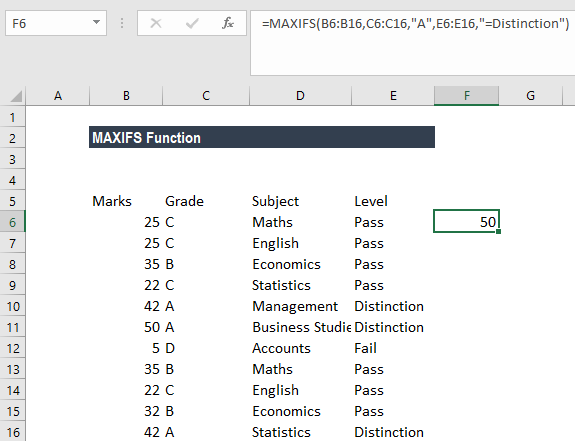 The MAXIFS function was introduced in MS Excel 2016. Max_range (required argument) – The actual range of cells from which the maximum value will be determined. Criteria_range (required argument) – The set of cells to be evaluated with the criteria. Criteria1 (required argument) – Here, we will give a number, expression, or text that defines which cells will be evaluated as maximum. Criteria_range2 – An optional argument wherein we can specify the additional ranges and their associated criteria. 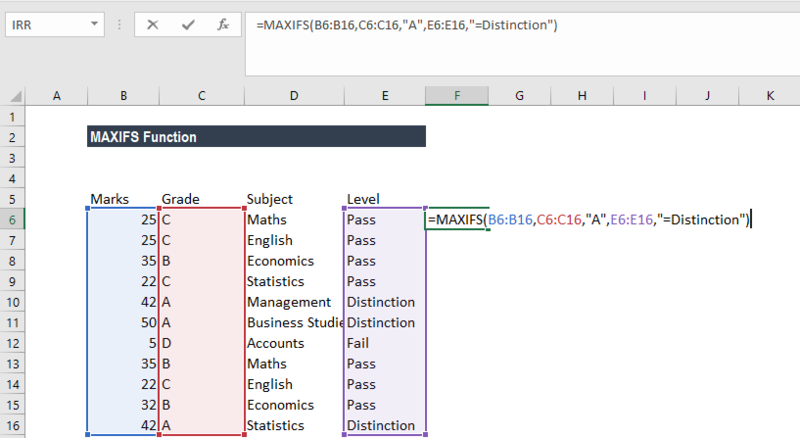 MS Excel allows putting in up to 126 criteria. 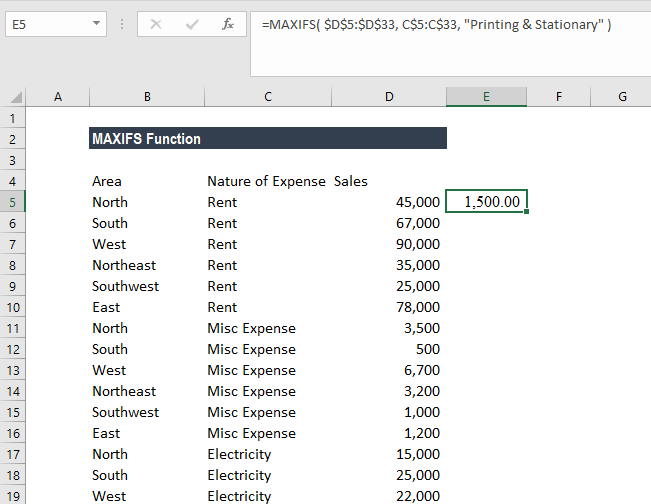 How to use the MAXIFS Function in Excel? 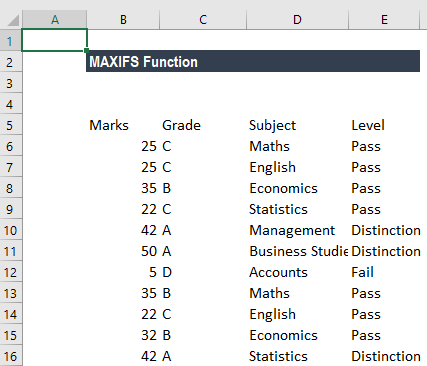 In the example above, the Excel MAXIFS function identifies rows where the value in column B is equal to North, and returns the maximum value from the corresponding values in column D.
In this example, the MAXIFS Function identifies rows where the value in column A is equal to North and returns the maximum value from the corresponding values in column C.
The formula will return the amount with the expense of Printing & stationary. In criteria_range1, C10, C11, and C16 match the criteria of “A” of the corresponding cells in criteria_range2, E10, E11 and E16 match the criteria of Distinction. Finally, of the corresponding cells in max_range, B11 gives the maximum value. The result is therefore 50. 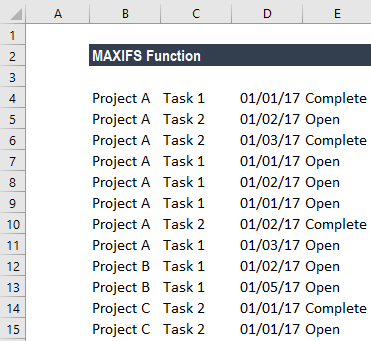 So, for the data example above, we would expect to see 01/03/2017 in Column F on all rows for Project A; 01/05/2017 for all rows of Project B; and 01/01/2017 for all rows of Project C.
For parentheses, we need to press Ctrl+Shift+Enter the first time we input it because it only works as an array formula. After that, we can drag it over the range where you need it. #VALUE! error – It is returned when size and shape of the max_range and criteria_rangeN arguments aren’t the same. 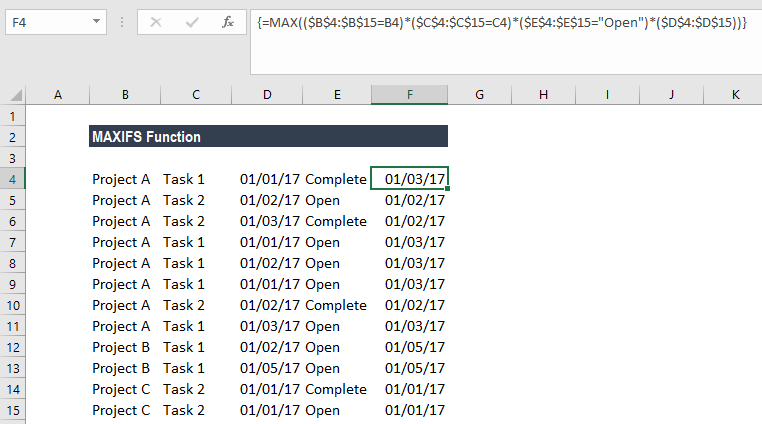 If we are using earlier versions of Excel, we can use an array formula based on MAX and IF to find minimum values with criteria. #NAME? error – Occurs when we are using an older function of Excel. MAXIFS will include rows that are hidden.